Nieto Morales, F., R. Wittek, and L. Heyse. (2013). After the Reform: Change in Dutch Public and Private Organizations. 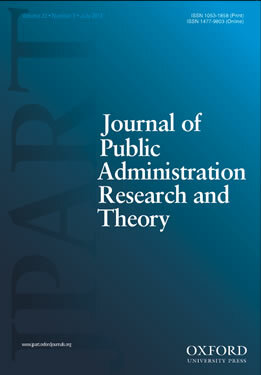 Journal of Public Administration Research and Theory 23 (3), 735-754. Proponents of new public management (NPM) expect public organizations to become more flexible and adaptive after administrative reforms, effectively showing convergence with patterns of organizational change in the private sector. This ‘‘convergence argument’’ is tested with a sample of 61 public and 61 private organizations in the Netherlands. We analyze whether public organizations, after 20 years of NPM reform, have changed their organizational structures and internal policies in relation to competitive, regulatory, and autonomy pressures, similarly to private organizations. Statistical analyses show that competition increases the incidence of change both in public and private organizations. High managerial autonomy and exposure to regulatory pressures relate to increased incidence of change in public organizations, but not in private ones. The results support the idea that NPM reform has made public organizations more similar to private organizations but that some concrete differences persist between private and public management in the Netherlands.